The final Battle of the Hill 2011editon is in the books. 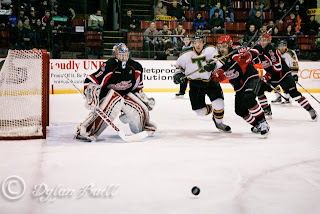 It saw UNB eek out an overtime victory against the visiting Tommies at the AUC. STU was heavily out shot 43 - 16 but were able to stick to the game plan for the entire 60 minutes plus. 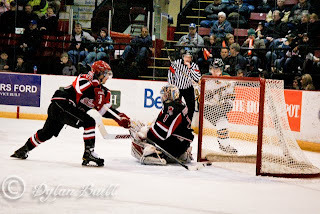 UNB opened the scoring in the first period when Diane Todd snapped one past Charles Lavigne in the STU net. The Tommies generated few chances in the opening frame and were out shot 14 - 3. Stephen Sanza (Cameron) would tie things up at 7:22 of the second when he raced down the right side and sniped one past Travis Fullerton. UNB would surge ahead at 16:14. The goal is recorded as being shorthanded but it came just as a STU penalty expired and the Tommies were starting a PP. Bryan Main had just stepped onto the ice from the penalty box, so unofficially it was a 4 on 4. 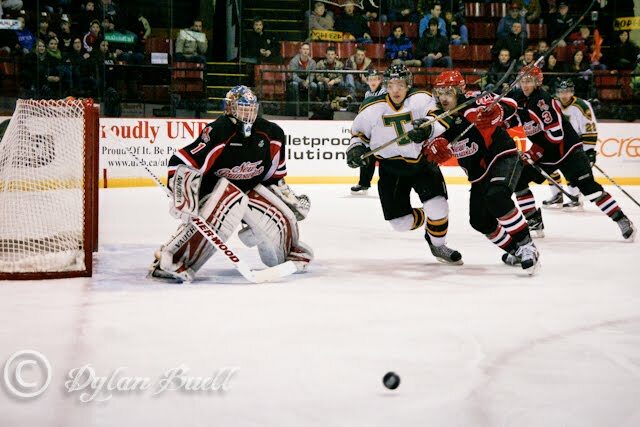 The Squirrels pounded Charles Lavigne with 21 shots in the second and mounted several long periods of sustained pressure in the St. Thomas end. The third had the Tommies tie the game at 4:37 off the stick of Randy Cameron (Reich, Sanza). 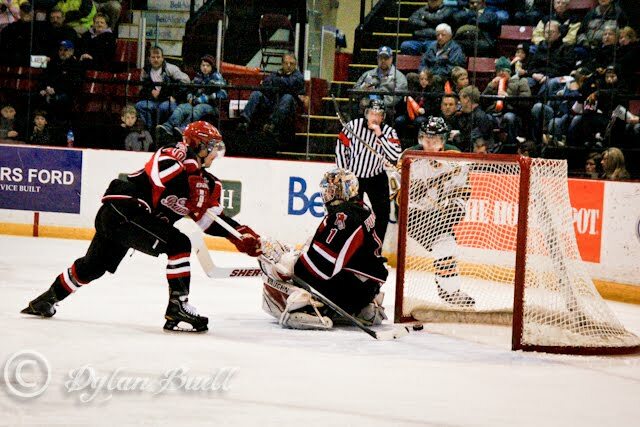 According to the referee, the puck just went over the goal line after sneaking by the UNB net minder. The goal light did not come on and the Squirrels were not impressed with the call but the goal stood. St. Thomas would have several power plays late in the third period, including a long 5 on 3, but UNB held on to force overtime. Travis Fullerton made a larcenous save with under a minute to go and bailed his Squirrel team mates out. The overtime didn't last long as UNB controlled the play in the STU end but the winning goal was flukey, as it went past Lavigne, after hitting a Tommies d-man's leg. The winner was scored at 1:54 of the extra frame. Even though Lavigne made 40 saves on the night, he wasn't even awarded a star of the game honour. He was first STAR in our books with #2 to Steve Sanza and #3 to Randy Cameron. That wraps up the first half and when the second half resumes we hope Matt Eagles, Christian Morin, and Alex Labonte will be healthy enough to resume playing. We are also looking forward to the return of Chris Van Laren from suspension, as well as adding Sebastian Bernier to the line-up. Maybe if we are lucky, Coach Ryan will land another player to add as well. Charles Lavigne was given second star. Dave Morell botched the announcement.